Throw it into my E Fund - This is actually the most appealing option as I am making efforts to increase the balance. Yet I’m not sure if it’s the most efficient use. Set back for School - I know come December/January I will be needing new books and I want to keep up not taking out a loan. Alternatively I could set it back for my Western expenses. I should be starting in the Fall of 2013, if everything goes the way I want it to. Leave it in my Business – This option would mean I leave the profits in my business as a cushion, for future payments. The most likely candidates are to set it back for school and as a business cushion. I think I will split it half and half and keep on planing. On a side note I want to get another one of my goals started, and that is to run several sites for profit, maybe even do an E-book or two. I have a feeling that Western will be more then i can afford and I want to ensure that I can go. As you may know from my earlier articles I am a college student and I was talking about the cost of books in the last post. I have since bought the last text book only to receive my car insurance bill in the mail. Which had me thinking on how I should purchase costly items in the future. Which I consider anything over $150 a costly purchase cause I am paid $500 every month. Currently when I make a big purchase I look at all my accounts, even my business ones. Then I decide if it’s really worth the cost. Which in most cases I end up paying myself extra to cover the price. Making me wished I didn’t do that or that I would pay myself more. Each time I will get the thought of just being like everyone else and using only what I have personally, only to keep on doing this. So where I want to be is a point where I have enough money in my (personal) account to cover the purchases I know I will be making. One purchase I know is coming up soon is Christmas gifts, even though there’s still another three months I know now I need to make these changes. 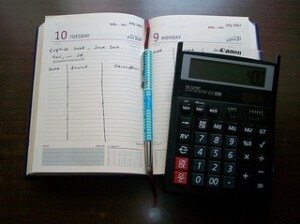 Keep to the budget, keep to the budget, keep to the budget – I cannot express how lazy I’ve gotten on budgeting. I used to set one each month but here lately I haven’t set down and actually created one. Have a minimum balance of $100 in my account before I pay myself - I used to have this, until recently. Now by the time I’ve paid myself it seams like half of it is gone since I will delay filling up my tank (~$50/$60) along with funding my E. Fund and other expenses I transfer out. (sometimes $65, other times $25). Which I’m lucky if I have even $20 in my account before payday. Set aside money for fun/gifts - This will be new because I haven’t ever set aside money for gifts. But I have had fun money ($15/mo) but I haven’t had a set amount in months so it back fires now since I no longer track it. So when I see an object I want I just check my accounts like I said above and buy it, without thinking if I have any bills or transfers coming up. Increase my efforts of paying off my Student Loan - This doesn’t fit here but I can’t help but think about it when I see how much interest I have accrued in 2012 that I have yet to pay back. It’s in the $200 range right now, and the last thing I would want is for it to be capitalized. So these are the things I need to start doing and change to better be ready for big purchases, with a few goals mixed in. I am going to start working extra on projects I subcontract on and divide the differences between the goals I have listed. I figure that having an extra $50 here or $25 there that I can throw at any of the goals will be a start. You just got paid from your job, and you feel like you can buy anything you want to (within reason.) Within a few days all your money is gone (from buying junk) and now you have to sit bored waiting till the next pay day. But while you had the money you believed that there was more available, then you checked your balance and you have maybe five dollars till you overdraft. I’ve experienced this in my life, even just recently, just not to that extreme of within a few days. But for me it was a case of buying more then I should have. Coupled with the fact that I went out of county and took my significant other shopping. But I did enjoy that day which more then made up not being able to do anything for about a week. Now if I hadn’t enjoyed myself but instead bills pushed me to the edge then I might have been more upset and angry. Even more important was that I wasn’t stressed out, cause I knew I would be getting paid by the company I own soon. Now that my (good) experience being short term broke is over I do have to look at it through someone else’s eyes, someone who was broke cause of expenses or from overspending on material things with no pay in sight. I would have freaked out and been stressed. No buffer – This would have been the biggest issue, cause if any unexpected expenses came up (think car being towed) then I would have been worried. Which would have been way out of my comfort zone. Debt Cycle - I call this where you get in debt to hold yourself over till the next payday, only to pay back the debt and be broke again. Think about it, if you use your credit card to pay all your bills then as soon as you get paid you pay off the credit card. If your not careful you could be broke again since you “lived” off of the credit card, which would start a bad cycle that would be hard to break. Couldn’t Go Out - This affected my significant other more then me. With no money to freely spend we wasn’t able to get out and I had to remind myself I can’t spend. I ended up putting the debit card inside a drawer until I paid myself. I knew if I went out and just charged the amount I risked placing myself in the Debt Cycle, which I wanted to avoid. These are the big three for myself that being broke would have limited. P.S. Happy Fourth of July and try to stay out of debt during this Holiday Season. As I type this post I sit at a desk with papers covering it. I look across my room and see a table with junk in it. Then past the table is a stack of magazines that’s been there since 2008. Lots of junk that needs to be stored or thrown out. I debated on attaching a picture but felt like we could envision that instead. Money Clutter - I consider this to be when your money and financial life isn’t in order and it’s over complicated. I.e. you have no idea where all your money is going or how money flows in and out. Kinda like where you spend a lot and you do not track it and you get a bunch of bills in and they just accumulate. Task Clutter - I have several items on my to do list and it seams crowded. Instead of just setting one project a week to do, I try to fit in several. Which I hardly manage to get just the one done. But had I just set the one project to be done I could have focused all my attention on it and marked it off my list. Else it’s just “cluttering” my list up. Emotional Clutter - We should all have a good idea on what this is. We commonly refer to it as “emotional baggage” or some other term that just means past feelings that were bad or painful for us. This one is a bit harder to get rid of, but never the less it holds us down. I’m sure you get the where I’m going with this. It is very important that you keep your life uncluttered as much as you can. This week my to do list is to remove some physical clutter and hopefully remove the table that sits in the middle of my room. Just an update on the trying to only use $20 cash for the weekend, it failed since I went out to eat with family. But it was less then $40 so at least it wasn’t double.